Acclaimed artists will collaborate with a literary geographer to explore the hidden histories of Hayling Island’s working class community using short stories, spoken word, audio soundscapes, visual art and an evolving online map of the island. Work in progress versions of short stories and audio will be shared at three literary events across October 2017 held in Hayling, Manchester and Durham. A true island completely surrounded by sea, Hayling is off the south coast of England in Hampshire, near Portsmouth. It is home to a working class community and is rich in overlooked histories, from the arcades and smugglers’ tunnels to the nearby military base. It is a place of resilience and contrasts, and as the water rises, there are no climate change deniers to be found. Using remembered histories of local people and the geography of the island itself as inspiration, four Manchester-based artists, led by writer and spoken word artist Michelle Green will create an interactive digital map housing a short story collection and accompanying audio. All events are supported by Arts Council England and New Writing North. Michelle Green is an acclaimed writer and spoken word artist born on Hayling, now based in Manchester. She was two when her parents left the island, and so her ‘memories’ take the form of many stories from her extended family, centred on the arcades, bingos, cafes and clubs they ran in the 70s along one of the tourist strips, just as the arrival of package holidays was beginning to take its toll on the local economy. Hayling has always been a tenacious place, and it is from this that interesting stories grow. Michelle is particularly interested in the lives that are pushed to the margins – working class, disabled, disenfranchised – and those living at the water’s edge as the sea rises. 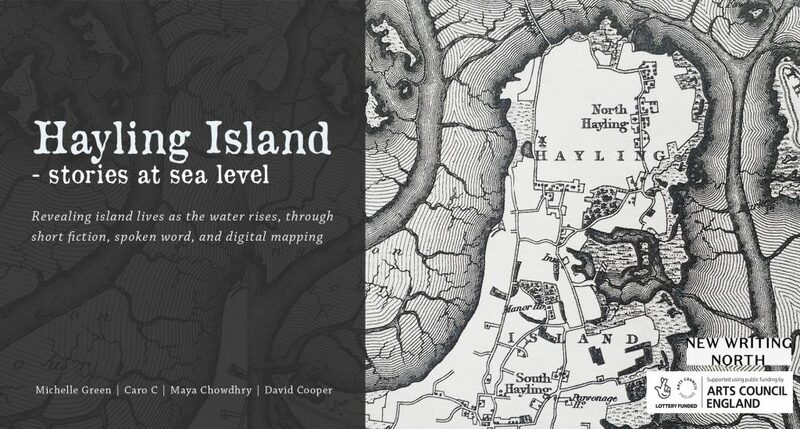 The Hayling Island digital story map will be designed by Maya Chowdhry, an interactive artist, writer and poet. It will comprise collage of historical documents, hand-drawn elements and audio hotspots where audiences can listen to or read the stories. The map will also link to local tidal reports and will change according to the real-time tide on the island. The audio elements of the map, overseen by facilitator in sound and ‘sonic enchantress’ Caro C, will take a sensitive radio-quality approach, adding depth to the world of each story and providing access to audiences who struggle with text. Caro will also create a unique piece of music that responds to the sonic environment of the island. Creative non-fiction co-author and literary geographies consultant Dr David Cooper is a senior lecturer in the Department of English at Manchester Metropolitan University. He will co-author pieces of creative non-fiction with Michelle Green, as a geographic exploration of the island that takes subjective experience of the place as the starting point.